Red Alert! Protestant Couple 'Security Threat' to Turkey! 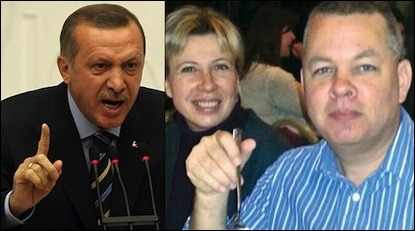 Turkish President Recep Tayyip Erdogan (left) demands tolerance for Muslims living in the West even as he moves to deport Pastor Andrew Craig Brunson and his wife (right) for carrying out "missionary activity and receiv[ing] money from sources abroad." Over the past several years Turkish President Recep Tayyip Erdogan has pressured Greece to construct a mosque in Athens. He has criticized the country which boasts the only European capital without a mosque. He does not hide his passion for mosques worldwide. In 2015 Erdogan proposed the construction of a mosque in secular, Communist-ruled Cuba. Also in 2015, he went to Moscow for the inauguration of the biggest mosque in the Russian capital. Earlier this year Erdogan pleasantly announced his presence at the opening of the biggest mosque in Amsterdam. The mosque is called "Hagia Sophia," named after a Greek Orthodox Christian basilica built in 537 AD in Constantinople, reflecting the typical Muslim extremist obsession with "conquest." Recently Erdogan has also been eyeing Iraq. As recently as April, Erdogan attended the opening ceremony of a culture center and mosque in Maryland, United States. The complex, the only one in the United States to feature two minarets, was constructed in the style of 16th century Ottoman architecture, with a central dome, half domes and cupolas, echoing Istanbul's Suleymaniye Mosque. At the ceremony, Erdogan said: "Unfortunately, we are going through a rough time all around the world. Intolerance towards Muslims is on the rise not only here in the United States but also around the globe." Intolerance toward Muslims? Back in Turkey, an article published in the monthly magazine of the country's powerful (and wealthy) Islamic Directorate for Religious Affairs (Diyanet in Turkish) warned of the spreading new "religion" of Jediism -- the religion of the Jedi knights from the Star Wars film series. But not all "religious tolerance" stories in Turkey are equally off the wall. Synagogues in Turkey have quietly tightened security. Scholar Rifat Bali, who has written several books on Turkey's Jews, says that Christians and Jews are being targeted. Indeed, threats against Christians and churches on social media by Islamists in Turkey have intensified. "Some people have sent death threats to the mobile phones of 15 pastors," says Umut Sahin, the secretary-general of the Union of Protestant Churches, an umbrella organization for Protestant denominations in Turkey. How do a few thousand Christians threaten a Muslim country of 80 million? Andrew Craig Brunson, pastor at a protestant church in Izmir, on Turkey's Aegean coast, survived an armed attack on April 11, 2011. The attacker, Mehmet Ali Eren, shouted: "Traitors! We'll bomb your church!" Eren had just been acquitted in a trial on charges of being a member of al-Qaeda. Brunson and his wife, Norine Lyn, have been living in Turkey for 20 years. On October 7, the couple was summoned to a police station. The police told them that they would be deported from Turkey because they "posed a national security threat" to the country. A two-member terror organization? Bombings and killings? Not exactly that, the police explained. The pastor and his wife were being expelled on grounds of posing a security threat because they had carried out "missionary activity and received money from sources abroad." There must be merely a few thousand Protestants in Turkey, a country of nearly 80 million people, where politicians often boast that 99% of the population is Muslim. Why do nearly 80 million people view a few thousand people as threats to their national security just because the few thousand belong to a different faith? This question probably falls not into the scope of theological discipline, nor political science, but social psychiatry. But there is a more serious aspect of this limitless Islamic hypocrisy. Erdogan should explain why he persistently demands more and more tolerance for Muslims living in non-Muslim lands, including the building of mosques in every capital, while his government can deport two Protestants on the spurious grounds that they pose a security threat to his country. The Islamophobia that Erdogan never ceases to claim exists in the Western world may or may not be a real social malady, but non-Muslimphobia in Turkey is increasingly a contagious malady. Erdogan's determined denials do not make him right; instead he further proves his religious-ideological incompatibility with Western democracies.